When picking a defensive shotgun load, the two most obvious options are buckshot or slugs. Steel F and lead BB shot could be entertained in a pinch, though F and BB shot sizes (0.22 inches and 0.18 inches in diameter, respectively) are smaller than buckshot. If a person wanted to consider a less lethal option, a rubber slug is less likely to kill a person — though a headshot would likely be able to turn the trick — but will hurt a lot. That said, slugs or either 00 or 000 buckshot are better choices. The mass of these projectiles ensure penetration (which is why birdshot is a non-starter except at basically point-blank range) and thus the requisite damage to soft targets to be effective. Which is better, though? A shotgun slug is a good choice for a self-defense round. Slugs differ by manufacturer, but are generally either a solid lead slug or a sabot; a solid lead or jacketed bullet surrounded by a plastic jacket. Solid slugs also feature wadding, which will probably hit an attacker at home defense distances. Most slugs are 1 ounce. Rifled slugs intended for use in a smooth barrel are most common. Some are solid lead, while others are hollow; it depends on what you buy. Sabot rounds are often jacketed soft points, mostly used for hunting in rifled shotguns. Basically, it’s a modern-day Minie Ball. You can keep home invaders at bay while shouting the battle cry of freedom. Now, slugs are actually a good choice for self-defense for a few reasons. As they are solid lead, they pack a wallop. Since they are cast lead in most cases, instead of jacketed bullets, they also deform when hitting a soft target due to the hydraulic pressure, often breaking apart. You do need to shoot accurately, of course. You’ll have to put in some range work to get proficient, but at close range (inside 20 the yards typical defensive shooting distance) it shouldn’t be too difficult. The TL;DR is big lead bullet hits bad guy hard, stays in body cavity. Kind of ideal if you want a long gun for home defense … though with caveats, which we’ll get into later. Of course, the standard defensive shotgun load is buckshot. Infantry and police have used buckshot for more than a century. Some of the doughboys in WWI had Winchester 1897 shotguns for action in the trenches; some Army and Marine units packed Model 1897s and Model 1912s in the Pacific theater in WWII, Korea and Vietnam. It’s also good for hunting, though it’s better suited to close range in thick timber. Rifled slugs are the preferred medicine in shotgun-only jurisdictions. Buckshot is the largest shot before getting to rifled slugs, with size 00 and 000 being the largest. Size 00 is 0.33 inches in diameter and size 000 is 0.36 inches in diameter. Both sizes are available in every gauge, including 410, though 12 gauge is the most common. You would be just as well served with a 20-gauge, though you get fewer pellets per shell. For 12-gauge applications, the number of pellets depends on shot size and shell length. Typically, you get eight to 10 pellets of 00 in a 2 3/4-inch shell, 11 to 13 in a 3-inch shell and up to 15 in a 3 1/2-inch shell. The latter; however, is stout; that No. 2 high-speed duck load is going to seem like a picnic in comparison. The 3 1/2-inch load in 000 is less common, but you can expect eight pellets of 000 in a 2 3/4-inch shell and 10 in a 3-inch shell. Typical muzzle velocities are 1,100 to 1,400 feet per second. Shot clusters tightly at personal defense distances, so accuracy is needed. 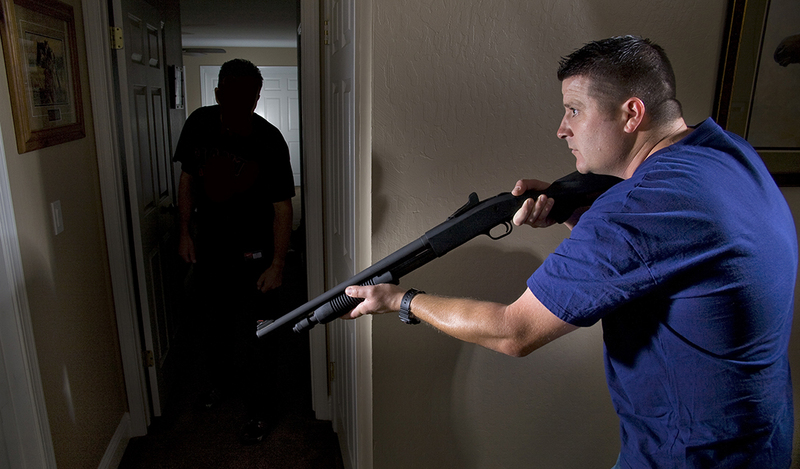 There’s a hitch, however, when it comes to using a shotgun as a home defense weapon, namely over-penetration. Of course, this is a concern regardless of firearm; pistol, shotgun, AR-15, whatever. The point is that you had better not miss. The Box O’ Truth does a bit of ammunition testing now and again, including with shotgun slugs and buckshot. One test is shooting loads through drywall that’s spaced like a typical home. Repeatedly buckshot and slugs go through drywall, even with insulation, like a hot knife through butter. Birdshot only penetrated one wall in one of their tests; however, the shot cup penetrated a second wall. Of course, birdshot will only wound an attacker, and you want to be able to put a home invader down. Granted, this applies equally to handguns. 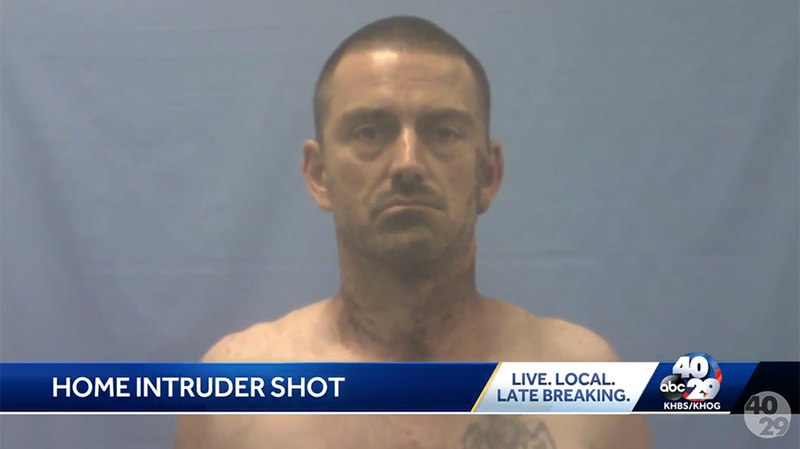 Handgun rounds punch through drywall just as easily and far as buckshot; don’t kid yourself for a moment about the potential for disaster to happen. Therefore, if you’re going to have a gun, any gun, for home defense, put in time at the range. You need to be able to hit what you’re aiming at and a shotgun is not for “spray and pray.” Shot spreads, but only at longer distances and even then you still need to aim well. Sam Hoober is a contributing editor for Alien Gear Holsters, a subsidiary of Tedder Industries. 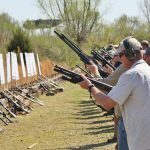 The post Choosing Between Buckshot and Slugs for Defensive Shotgun Loads appeared first on Personal Defense World.